Run With The Wind continues to be surprisingly compelling despite being a show about ten guys running around in circles. Okay, I’m not into watching marathons or track. What continues to sell this story are the characters and the way their progress is being handled. While not as overt emotional development as we are seeing in Tsurune, Run With The Wind excels at small moments and small triumphs. While Kakeru and Haiji continue to get the lion’s share of the focus each team member is given enough smaller moments scattered throughout episodes that we don’t forget them and they all feel like they are going on this journey. After the gap between episode 11 and 12 we have a new OP and ED. I’m not sold on the OP at all but the ED is pretty great. The rest of the sound remains on point and this is one anime where the sound direction continues to need to be applauded. Takashi and Yuki get a moment to shine and celebrate early in this episode and it was nice to see this small moment. They didn’t win the race but they both managed a qualifying time and it feels like a very natural development given how close both of these characters have been to this previously. I also loved that the team dynamic is still very much in tact with the twins stealing a lot of dialogue but each character having their moment. The one disappointment from this episode was the decided absence of Prince quips and his only real contribution was getting travel sick on the way to the camp. However, by the end of the episode all the earlier moments may fade from memory as the episode veers very much into another round of Kakeru has issues and the red-haired guy from the other school whose name I won’t ever remember is still being a jerk. It kind of leaves a sour taste as it feels like this whole plot line has lingered far too long without either being addressed or resolving and at this point I’d really like it to as almost everything else in the anime is more interesting. Still, Run With The Wind remains a compelling viewing experience and one that I’m still pleasantly surprised by. Looking forward to where it goes during its second cour. As much as I hate to admit it, Haiji has a point. Kakeru really can’t see what the point of running is anymore, other than getting a great time and winning, and while I kind of get where Kakeru is coming from, given they are in a competition, I really do get where Haiji is coming from. Besides, Kakeru targeting Prince was a low blow. It isn’t as though Prince didn’t know he wasn’t good at running. Kakeru being benched this week on Run With The Wind created a chance for the audience to observe the others from a distance as well. While at first most were reluctant to join Haiji in his dream, and many were coerced, the five who competed this week gave it all they had and those who were on the side were moved by their effort and a desire to cheer them on. All and all, the power of the ‘team’ coming together even if none of the runners were successful this time around at getting an official time. Of course, Run With The Wind wasn’t really content just to give us a ‘go team’ kind of message and working at bringing Kakeru back in with the others, despite him being a massive jerk last week and at the start of the episode. Instead we layer in signs that Haiji isn’t as ‘recovered’ as he’d like people to believe and that escalates as the episode continues. Given we still don’t know what actually happened, I’m curious as to what is going on, but the eventual collapse of the team leader was a suitably dramatic end point for the episode. Where this anime shines is that none of the characters feel neglected at this point. It is quite the feat given the sheer number of characters. And while I don’t necessarily like all of them, they are all feeling very authentic and the group as a whole is becoming more and more interesting to watch. What Happens When Individuals Become a Team? I guess Tsurune really does want us to wonder how this group of individuals will come together as a team. Anime really has a fascination with team culture, though I guess that really is a direct result of the Japanese culture behind most anime. However, as Onogi points out, generally speaking Archery is a solo effort. Even when you shoot with a team it isn’t as though you can directly assist your team-mates during their shoot. All you can do is your best and hope that you’ve all helped each other enough during training that you are all at your best come competition. The problem facing the boys in this episode is that there are two distinct groups in this ‘team’ and they aren’t meshing well at all (wow, I really wish I didn’t have to use the word ‘mesh’ but it is the perfect fit here so I’ll banish the Hand Shakers trauma and move on). I’m assuming this training camp deal we’re about to start is either going to bring them closer together or tear them apart so they can be rebuilt as a team, but either way it is following fairly standard sport anime protocol at this point. One thing that did really bother me in this episode was the treatment of the females in the archery club. Masaki introduces himself, all the boys get an introduction or introduce themselves, and then Masaki swiftly declares it is time to get started. Seriously, are the three girls just standing there to fill in the frame? And while they get to compete later and I get they are trying to get the boys to form something resembling a team, it seems a little bit like a dig at them that they are joined by the coach and the teacher in order to beat the boys (one of the boys already sufficiently suffering from target panic that he was never going to get a hit, so technically it was five against four in favour of the clearly stronger teacher team with the back-up support of the three girls who didn’t even get to name themselves this episode). Alright, sexism in anime isn’t exactly new and this wasn’t really an overt attack on females or their ability at archery, but it all just kind of bugged me as a totally unnecessary element at all. How hard would it have been to have actually given the girls an introduction? However, because I do not want to end on a sour note, mostly because this show is pretty great even if it is losing a little of the beautiful edge it started with, I would like to applaud the sound effects and just the ambient sound in this anime. Seriously amazing work and realistically you could just close your eyes during the shooting, hear the creak of the bow and release of the arrow, the whoosh of the arrow through the air and the thunk as it strikes (the target or otherwise). Absolutely amazing and something I can’t get enough of. We knew from the end of episode 2 that Minato was going to return to the archery club, and as expected things aren’t exactly easy. He still can’t shoot the way he wants, one friend keeps looking at him like he’s worried he’s about to bolt at any moment, another at first makes the casual assumption he’s over his whole trauma thing just like that, and new acquaintances are generally hostile given they perceive his actions as taking the whole thing flippantly (given he left the club and came back in seemingly a matter of days). I’d like to know too, because that explanation made zero sense. However, Tsurune may be wallowing in teenage drama this episode, but it feels like it is worth it. Minato’s problem isn’t an easy one and has left quite the mark on him and right from episode 1 this anime has played his trauma straight and given it the respect it deserves while not becoming self-indulgent by falling into angsty-back-story territory. It is a fine line to walk and one that this anime has the emotional control and strength of writing to navigate, or at least it has so far. When the teacher takes a back seat and simply says he is observing the conflicts with interest, I had to nod along as I was also very much enjoying being the spectator for the goings on. It isn’t that Tsurune is doing anything we haven’t seen before (admittedly, this is the first time I’ve seen it in an archery setting), it is more that it is doing what it is with such incredible competence and an unhurried hand. For all that I would love to see these guys shooting together, and I’m sure we’re moving toward there after the end of this episode given we’ve now got the hot-owl-carrying archer, Masaki, invovled as a coach, the time it is taking to really look at the starting point for this club feels like there’s a lot of care put into these characters. And while the lengths some of the friends seem to have gone to in order to help Minato might seem inordinate from a practical point of view, it makes for some fairly compelling watching and some fairly strong relationship building. Three episodes in and I must say I am definitely enjoying this one so far. There’s a couple of things Tsurune has gotten very right that makes this anime a fairly solid show and one I want to follow right from the beginning. Comparing to the other sports anime I’m watching at the moment, Run With The Wind, I feel I’ve clicked a bit more with this one. While Minato is also reluctant to continue in his chosen sport, unlike Run With The Wind, the other characters aren’t coercing and forcing him back. They are certainly nagging and encouraging (and a little overly intrusive), but ultimately the choice that he makes in this episode is his own decision that he has come to after his own reflection. The other thing that really grabs me in this story so far, other than just being gorgeous to watch, is that so far Minato, and all of the other characters, don’t appear to have some high minded goal like be the best in Japan or win some competition. The goal so far is to re-establish the archery club and now there’s a tournament they’ve decided to try entering, but ambition is so far being kept in check. Minato has been shown to be pursuing a sound and striving for the form that will given him that, and the other characters haven’t really established their motives just yet. I’m certain that at some point these guys will aim to win something, but so far it is more about pursuing the sport than pursuing victory and I really kind of appreciate that. Did they really just name the owl W’ho’? I did however have to do a double take in this episode, literally stopping and video and going back, and I’m certain that’s what they intended, when they suggested Takigawa was actually a ghost. It was a well executed moment because while you don’t really think this is an anime that is likely to actually have a ghost, it leaves you in just enough doubt that when Minato dives to stop him shooting the last arrow you are kind of glad, even if it does all turn out to be a silly misunderstanding. There’s a really relaxed feeling so far to this story but at the same time it feels like these characters have begun moving forward even as we’re only really just getting to meet them. Visually it has been pretty amazing with only a few group scenes where extras have looked a little bit off, and the music and environmental sounds have so far been really solid. I’m really enjoying this so far and I hope it continues as it has so far and I’d really like to start to get to know the rest of the cast a bit better now. Well, here’s a second sports anime on my line up for this season, but unlike Run With The Wind, this one I was actually looking forward to because I kind of wanted to see an anime about an archery club. 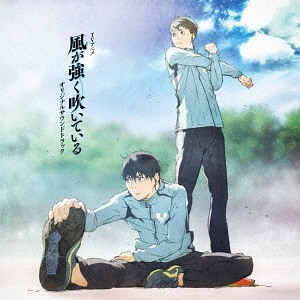 I wasn’t sure if I’d like it, but I was certainly waiting for the first episode, and it has not disappointed (though Run With the Wind is kind of blowing my expectations out of the water so maybe this season is just a season for me to enjoy boys playing sport, who knows). There’s nothing earth shattering about episode one. Minato is starting high school, a friend from middle-school is also going with him and they run into an old friend from elementary school. The school archery club is starting up again and they are getting roped into it but Minato has some past trauma that means he’s avoiding. When he finally gets dragged into shooting it becomes quite clear he’s got a bit of a psychological block going on. All and all, exactly what you would expect from a first episode of a school club anime focused on a sport. The cast are pleasant enough if not yet fleshed out and the pacing was really well done. So why am I so happy about this episode? Because much like a couple of other titles this season, this first episode is just oozing effort and attention to detail. The sounds particularly are beautifully done but there’s a real care and effort in shot composition and visuals going on in this episode that makes it a sheer delight to engage with even as it goes through the usual kind of set-up. While I stand by my overall opinion that good visuals and animation aren’t enough to make up for a poor story or characters, when the plot and characters are sound, it is amazing how much more vibrant the experience can become with a little care and effort on the other elements. Really looking forward to more of this one and hopefully it can continue to be so beautifully put together.